The last several weeks have been emotionally taxing for the entire nation. Many people are left wondering about the meaning of life, and some the new challenges that face our nation. Some are asking important questions: “What’s truly worthy of our aspirations? What kind of life is really worth striving for? Processing these questions can be a daunting task to complete on your own. Based on your culture, religion, or even family tradition these questions warrant different answers. Based on recent events, we each have to ask and answer for ourselves: What is the good life? What does it mean to live a flourishing life? Tough questions like these require mental muscles that may not have been used lately, if ever. We need each other’s help to ask and answer them well. The Yale Center for Faith & Culture and the Yale Office of International Affairs are collaborating on the first-ever Life Worth Living (LWL) retreat. LWL is an effort to revive critical discussion in universities and the broader culture about the most important question of our lives: What is a life worth living? The educational pedagogy is based on a class offered at Yale University called “Life Worth Living” (HUMS 411). During the retreat on November 3-5th at Yale, a range of philosophical and religious traditions are used to help participants develop habits of reflection that will equip them for the life-long process of discerning the good life. In addition to seminar readings from the foundational texts of each tradition, the course engages guest practitioners of the various religious traditions examined and offers a weekend retreat that invites participants to reflect on their own worldview and approach to the questions under consideration. 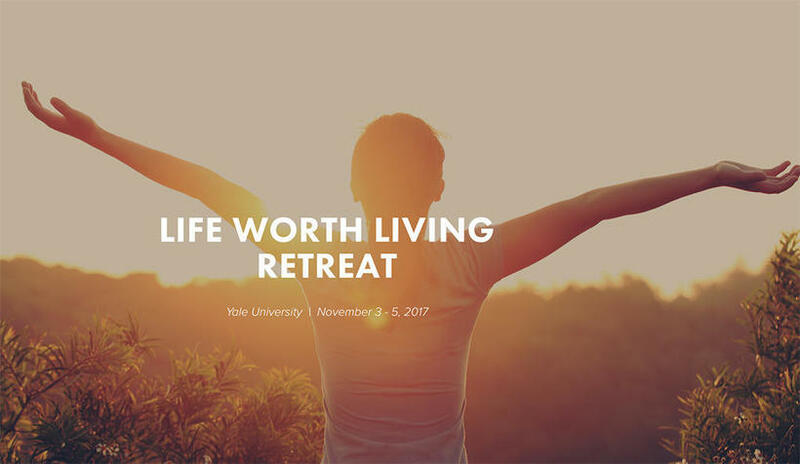 This three-day retreat takes the best of what the “Life Worth Living” semester-long course has to offer and makes it available to people beyond Yale University students. Participants of the Life Worth Living retreat will have an opportunity to reflect on their own views about the big questions in conversation with six diverse traditions of imagining a good life: Confucianism, Judaism, Christianity, Islam, Utilitarianism and Expressive Individualism. Participants are encouraged to bring their own stories and experiences to the learning experience, helping to build relationships in a group setting. The retreat will also feature two small-group sessions where participants will be invited to bring their own personal narratives to the learning process and help build a base of relationship among small group members.